Computers are a part of everyday life and technology is essential to our lives. Almost every task or activity that you carry out involves computers and technology. It can be difficult to imagine life without them. Therefore, understanding how computers work and being able to use them creatively gives you the power to affect the world around you in positive ways. This is why we study Computing. Problem solving and applying your own knowledge and Information Technology tools to solve a range of tasks. Being able to combine a range of technologies together to produce digital artefacts (products) and have the ability to evaluate them. Computing will bring new and exciting challenges. It will make you look at a computer and how it works in different ways. It will give pupils a chance to explore their digital skills and see the subject in a new light. In Year 7 we complete a project that combines all 3 strands of Computing together. Pupils will look at creating a mobile phone app for a given scenario. Pupils will look at file handling, presenting information and data handling (modelling). Pupils will look at e-safety in terms of acceptable behaviour online, how to report issues they come across, how to search efficiently and effectively and how search engines work. Pupils will look at spreadsheets, basic and advanced formulae/functions for set scenarios. Pupils will also look at creating a mobile phone app linked to the scenarios given. 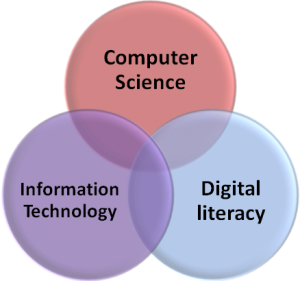 Pupils will look at what a computer is, the role of the different parts of the computer and will look at the basics of data representation (binary). Pupils will create a website that they have designed themselves and will do this using HTML. Pupils will look at how Computer Science and the Law interact in terms of GDPR, Computer Misuse Act and Freedom of Information Act. Pupils will create a range of programs using the micro:bit. Pupils will create a range of programs using the programming language Visual Basic. Pupils will look at how companies use databases to store data and look at the issues around storing data. Pupils will also look at how to use SQL to communicate with a database. Pupils will look at how to use the Computational Thinking techniques of decomposition, abstraction and algorithmic thinking to solve a set problem. Pupils will also look at sorting and searching algorithms. Pupils will create a range of programs using the programming language Python Pupils will look at Logic Gates and be able to create truth tables. Pupils will also understand what Boolean operators are and how they are used. Pupils will look at ways a system could be attacked, how these attacks can be prevented and how we can protect systems from these types of attack. Pupils will look further at binary and look at binary addition and subtraction. Pupils will also look at compression. Pupils are offered the opportunity of studying GCSE Computer Science. We follow the course delivered by OCR and is called Computer Science (9-1) – J276. The course gives pupils an excellent opportunity to investigate how computers work, how they are used and how to develop computer programming and problem solving skills. Pupils will be able to see how they can use these skills in everyday life and in business. This course may show pupils that computer science is a career they would like to explore. Pupils will study a Programming Project that will help to develop their programming skills and understanding which will help them towards their written exams. All pupils are required to complete the project and will be given 20 hours in order to do this.